I've gotta say that I wasn't too enthused to see Tony at first. I'm basically at rock 'n roll fan FIRST, and I don't consider Tony rock 'n roll. I basically remembered his radio hits from the '70s, along with the TV variety show. But, I was pleasantly surprised. Tony put on a hell of a show and in his 90-minute show, his energy level never slowed down. Not bad for a 58-year old. In fact I haven't seen many rock 'n roll bands that can match him energy-wise. First of all, I was surprised when Tony played his biggest hits first, belting out “Tie A Yellow Ribbon 'Round the Ole Oak Tree”, “Candida” and “Knock Three Times”. I was impressed. In the rock ‘n roll world you really gotta have balls to play your best-known material at the beginning of your show! Tony did the Catholic cross thing when he noticed that people were singing along, looking up saying, “yes they remember!” He also exclaimed that his “last hit was in 1977!" 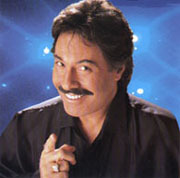 Orlando then said that he overheard a man in the front row say, "Tony Orlando sure got chubby". He laughed and said, "hey, when you're 57, this is your right as an American", pointing to his belly! After a little description of his early du-wop days, he sang, "Harmonizing Nights", "Stand By Me" and "Spanish Harlem". After singing, “Say, Has Anybody Seen My Sweet Gypsy Rose” Tony announced that this was his last night in Vegas after a 3 month stay. He proceeded to thank everyone in the staff, the light/sound guys, etc. Saying, "it feels like New Year's eve", Tony went into the audience to lead in versions of "Old Lange Sine", "When the Saints Go Marching In", "Amen" and "Jesus Christ Superstar". Then he said wanted to make the audience "feel good and nothing works better than a Beatles song to do that". He launched into "Cant Buy Me Love" and when he walked past our table, he saw DJ Ivan (with his newly shaved head) singing along. Tony exclaimed, "I was only 16 when this song came out and YOU know the words?!" Then we grabbed DJ Ivan in a headlock and kissed him on the head! At one point he made a joke about Frank Sinatra, relating a story. He had dreamed that there was a billboard/marquee with his name above Frank Sinatra. He later told this dream to Frank Sinatra and as a joke, Frank sent Tony a doctored photo of this exact layout, signed, "keep on dreamin' kid"! Three Beatles songs followed, "Oba Di, Obla Da", "Hey Jude" and "Let It Be". During “Let It Be”, Tony coaxed Sonny Turner onstage to sing a few bars. For those of you who know your rock ‘n roll history, Sonny Turner was a member of the Platters from 1961-1970 and is a rock and roll hall of fame inductee. After playing a cover of the Beatles, "Something", Orlando let his band feature a few numbers. I was impressed that he was not afraid to share the spotlight with his band. His band, Lefty Brothers was an outstanding backup band. Tony would joke, “I bet they can’t do James Brown” and the band would bust into “I Feel Good”. “Well, I bet they can’t do Willie Nelson” and keyboardist Kerry Cole would do a note-perfect imitation of Willie Nelson's "Always On My Mind". This continued with Johnny Cash's "Folsom Prison Blues", then Led Zeppelin’s "Whole Lotta Love" when Orlando said, “I bet they can’t do Zeppelin”. Next came a version of Neil Diamond’s “America” in which he recognized all the vets in the audience of WWII, Korea, Vietnam, Desert Storm and making a special recognition of a vet in the audience that had been a prisoner at the Hanoi Hilton during Vietnam. Tony continued with the “Hey Jude” chorus again. Suddenly, a voice came from the PA system..."ladies and gentlemen, tonight we have a very special treat for Tony. Tonight, united for the first time since the '70s...DAWN" Instead of two women walking out, two midgets in black face came out, one holding a beer. It was a joke by the Amazing Jonathan, who has an act in the same lounge right after Tony's act. There was much laughter and Jonathan said, "you know what midgets cost in Vegas? I had to buy this one a beer!" This was a hilarious end to the night and Tony seemed honestly surprised at Jonathan’s joke! Orlando was inducted into the Las Vegas Casino Legends Hall of Fame last year and it’s easy to see why. He is a consummate and polished Vegas performer, possessing a warm charisma, which translates to the audience. I walked away duly impressed. Hell, I even bought a CD in the lobby after the show!